Ages 3 through 8. Here is a collection of listening and speaking activities that can be used to develop sequencing skills as children sequence story pictures, respond to verbal instructions, identify errors in the order of events, and more. The story pictures may be reproduced. Sequencing Stories. This section includes 30 short stories. Each story is depicted in four pictures. The pictures may be reproduced to create sequencing cards. Sequencing Story Worksheets. The worksheets in this section can be used to record stories created by students. They can also be used for homework assignments and classroom coloring activities. Sequencing Situation Cards. 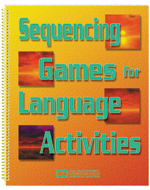 The game cards in this section can be used to stimulate the development of verbal expression and sequencing skills as students participate in activities related to tasks such as taking a bath or flying a kite. As students participate in the activities, they practice describing the steps necessary to complete common tasks.